The potato can be afflicted by a wide range of pests and diseases, many of which are carried in or on the tubers used for seed. Diseases can cause significant losses, reducing both yields and quality. Seed tubers free from disease are therefore required to assure successful yields and quality. Late blight is a serious fungal disease affecting tomatoes and potatoes. It can be spread by spores over large areas in a very short time. The disease is caused by the fungus Phytophthora infestans and requires a live host for reproduction. Late blight was discovered in commercial plantings in the Matanuska Valley in September of 2010 and there is still concern that the disease can cause further problems in Alaska. Late blight has been identified in commercial plantings four times in the last two decades. It was first found in commercial fields in 1995, and again in 1998, 2005 and 2010. In all instances, late blight had been reported in the continental United States earlier in the growing season. It was thought that the disease had been brought in on infected plant material and subsequently escaped to infect Alaskan fields. DNA testing has shown the late blight found in Alaska in 1995 was the US 7 strain. Those from 1998, 2005 and 2010 were found to be the US 11 strain. The most common strains of late blight found in the continental United States during 2009 and 2010 were US 22, US 23 and US 24, while US 11 has not been identified for several years. The hypothesis that the late blight found in 2010 came in on infected plant material is not supported by these facts. If the disease was freshly imported the strain found here would be the same as those strains found outside of Alaska. Agronomists at the Alaska Plant Materials Center have concluded that this disease has been overwintering in stored tubers. This is the most likely scenario for the repeat late blight infections detected. 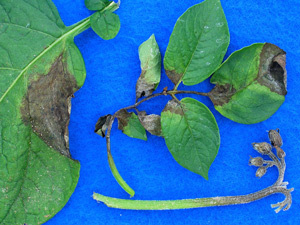 Late blight requires specific environmental conditions to grow. The wind borne spores require water on the surface of the plant, either as rain or dew, for a minimum of three hours to infect the plant. The time period from infection to new spores released can be a few as 2-½ days. The quick spread of this disease can be devastating to a crop. The employment of good management practices is critical to managing late blight. Alaska's cool air temperature may help slow down the growth rate of late blight. Given that the strain infecting Alaskan potatoes is now somewhat rare, PMC agronomists suspect that late blight has been here since 1995 and weather conditions were not conducive for an epidemic. Growers should be aware that there is the potential that infected potatoes have overwintered in storage and could cause an outbreak again. 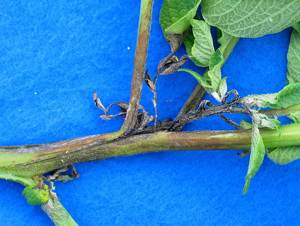 Cull potatoes are considered the most likely source of renewed infection the year following field identification of late blight. Infected seed can also provide the source of infection. Discard any seed potatoes showing obvious rot. Once planted infection will travel up the stem causing brown lesions on the stem above the soil line. The next symptom appears as water soaked areas on leaves that are dark in color. Suspicious plants should be carefully removed in whole and put into plastic bags for disposal to keep the spores from spreading. Control measures include close examination of the seed to remove diseased tubers, treating seed with a fungicide, regular scouting of fields and being prepared to apply a protectant fungicide.